Nowadays I am not making fried snacks as much I used to do. Yes with two kids it is always a daunting task. They will run into the kitchen and want to play there. My son only wants to sit with me. Also my hubby’s sugar level (A1C) is creeping up. I bought a packet of instant mashed potato a month ago thinking of making Aloo bhujia one day. Finally yesterday I was able to make it. These days boasting about achievements has become part of blogging; how many followers have you got? Then there is a food photography competition ? How many recipes have you written in one year? If you see me I am a lazy goose in this regard. I will post only as much as I can. Blogging is a hobby for me rather than a competition. I know even if I don’t blog, billions of people around the world will still be cooking and eating. My mom used to say to me “Nothing stops and waits for you”. You are only a little thing, so flow with the wind. Since I have instant potato flakes, Aloo Bhujia is really easy to make. Actually this dish is gluten free. It has only besan/ chickpea flour and mashed potato and some spices. When I checked the recipe in Google there are tons of variation. I used the spices which I normally use in this kind of snack along with chat masala. It is a taste that I acquired during childhood, for tea there will always be some snacks available. Mom did not make these kinds of snacks unless during the festivals, so dad would buy it from the store. However in Indian stores, the snacks available are not fresh, made somewhere on last year with never-ending expiry dates. 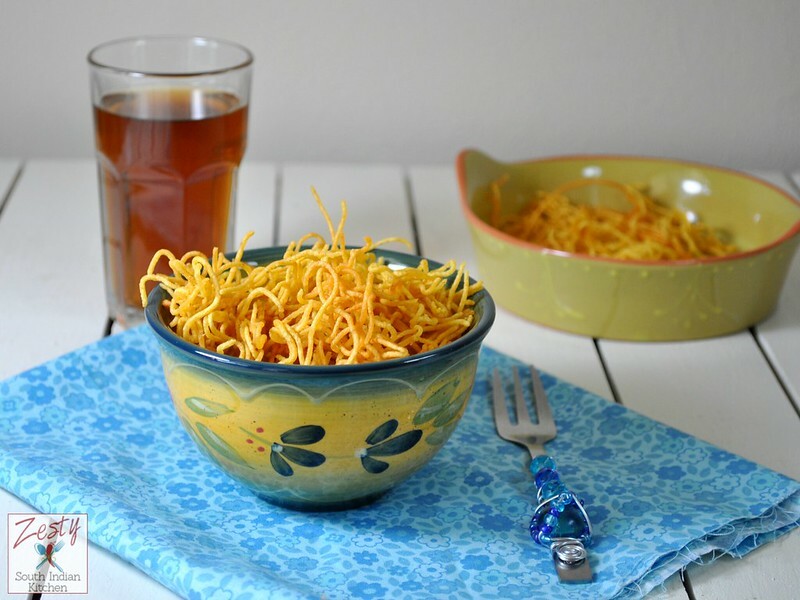 For this recipe you need a mold to make thin noodles, I have one from India, which my dad had bought for me. Just mix all the flour and spices and you don’t need to add any extra water. As when you dehydrate the potato flakes the water is is enough for making the dough for the noodles. Once you have made the noodles, you fry it in hot oil. Within few minutes your tasty snack is ready. If you don’t have instant potato flakes use a boiled potato and mash it. 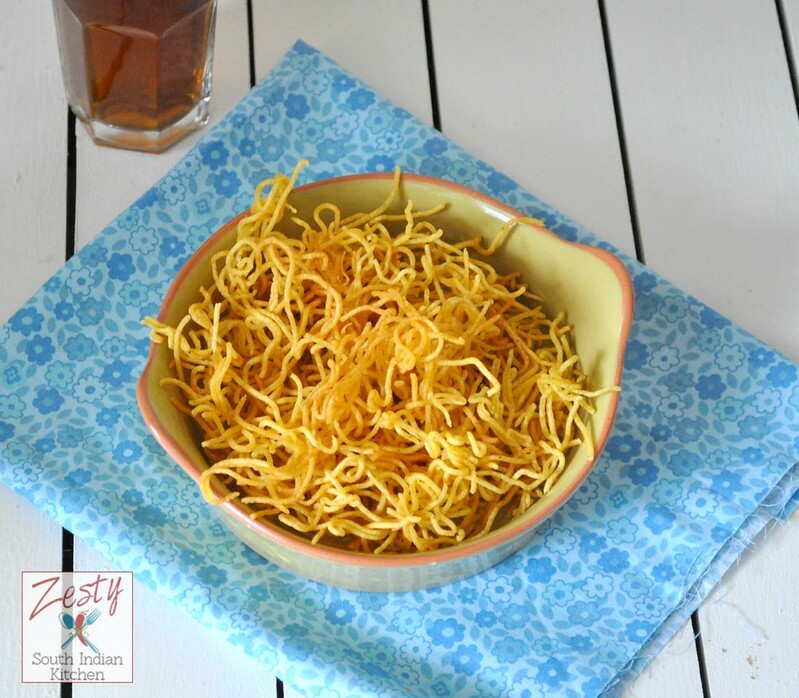 Here comes the recipe when you looking for an easy snack idea try this one. 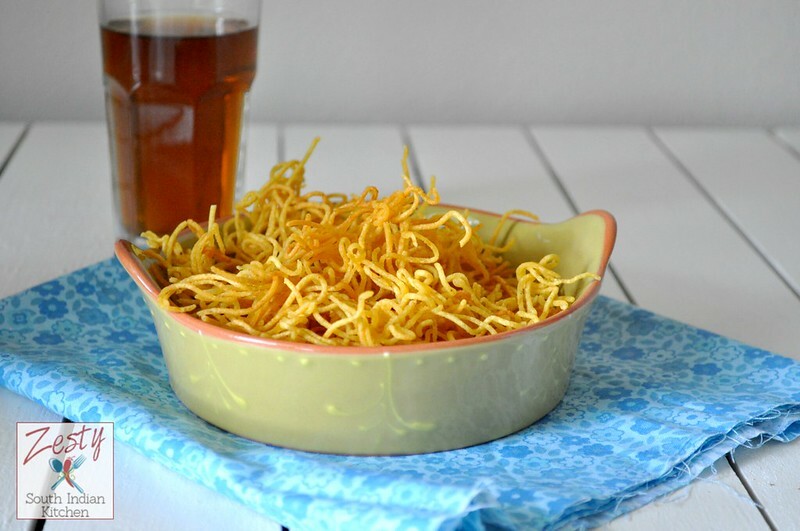 Delicious aloo bhujia snack makes your tea or coffee a bliss. In a small bowl mix instant potato flakes and hot water to form a thick dough. In another bowl add besan, salt, sugar, spices and mashed potato mixture. Mix everything thing to form a fine dough. Heat peanut oil in in a thick bottom pan. Transfer a small amount dough into the mold and press directly into the oil. After 1 minute flip and cook the other side for 30 seconds. Once it is golden color remove from the oil and transfer to kitchen towel to remove the excess oil. Continue the process until you finish the entire dough is used up. Store in an airtight container and enjoy with your favorite coffee or tea. Aloo bhujia looks crunchy,tasty & perfect. addictive snack for any time of the day.. I always love to munch something by late afternoon with a cup of Kadak chai. It peps me up. As you said there is nothing like homemade snacks and this one is yummy and has the right crunch and spice to go with my evening tea. Loved the clicks. 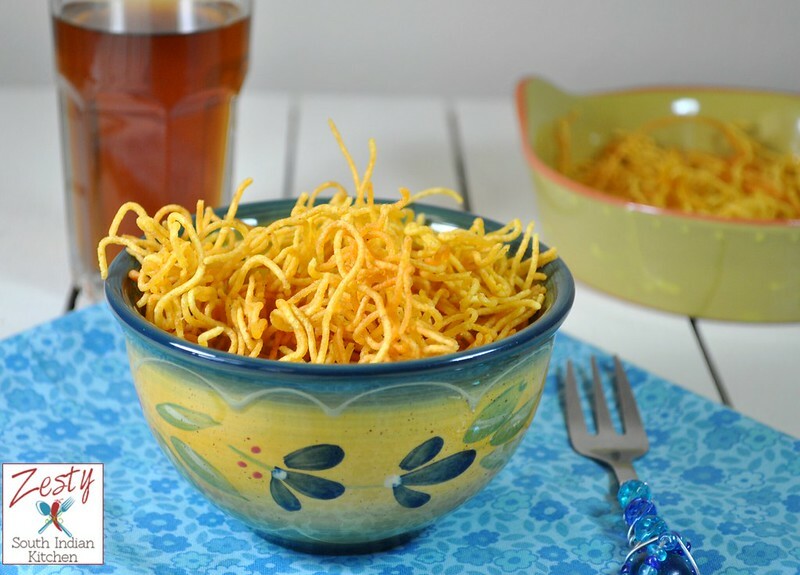 Crispy noodle with chickpea looks so crunchy and addictive! I would have to make double batch for munching on. So sorry I haven’t been here in a while. Stay safe my dear friend. Hope the rain storms are over. My mil recently gave me the metal press and I was wondering what to make… now I know what to do with it 🙂 Thanks for the recipe. your bhujia looks so nice and crispy. What a nice way to put Hungry jacks into bhuijia, looks similar to ommapodi minus the ajwain though! Nice post Swathi, would luv to have some with my tea! This is one of my favorite snacks.. looks very tempting.. Cutting down on fried food is good but once a while it’s ok. I like how you use the mold to turn instant mashed potato to fried potato noodles. Wow! Aloo bhujia looks divine!